My name is Sharkie Zartman and I would like to welcome you to my website. I am a health and fitness professor, an All-American Volleyball athlete, an established author of more than six books, a radio host, speaker, and holistic health coach. I am committed to bringing out the best in my students, clients, readers and listeners and feel so blessed to love what I do and do what I love. The first thing that most people want to know is why I have such a strange name. Yes, it is true–thanks to my dad, I am named after a killer fish. But life is fun when you are different, so here’s to being different! Always strive to be your best self—-not someone else. My new book with Dr. Robert Weil is now up on Amazon and hit #1 Best Seller in two categories three days after it was released! 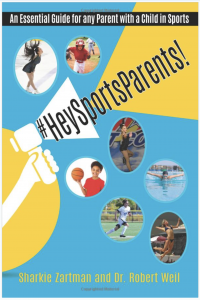 The title is #HeySportsParents and is an essential guide for any parent with a child in sports. Dr. Bob and I have over seventy years of combined youth sports experience, I, myself, as a former All-American volley­ball athlete, sports parent, youth and college coach, and Dr. Bob, a sports podia­trist, who has treated and worked with elite top level young athletes for decades. 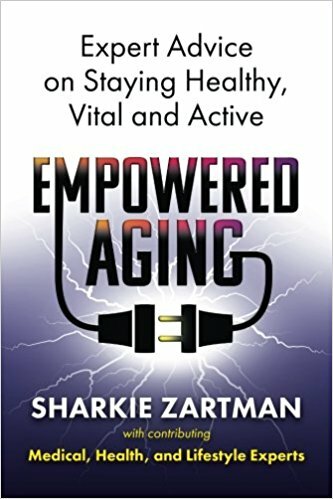 For Empowered Aging I recruited 13 experts, 9 of the doctors, to each write a chapter on how to live a healthy, happy, fulfilled life regardless of age. I also wrote the introduction and the first chapter. This book was definitely a team effort and I’m so proud of the final result and really believe that this book will help a lot of people! Do you find yourself dreading your next birthday? Get a new lease on life with Empowered Aging! Whether you are in your forties, fifties, sixties or beyond, Empowered Aging is written for you. You’ll discover how to reframe aging and retirement, learn about new medical advances for aging joints, receive advice on caring for your body through better nutrition, and get tips for building muscle and improving balance. You’ll also learn about a simple test to detect silent heart disease, holistic strategies for brain health, why integrative medicine is the missing link to aging successfully, and much more. Each chapter is written by a leading expert who offers advice on how to live a full, vibrant life at any age. It is a very readable book that is well-grounded and practical in the treatment of a range of topics related to aging. You’ll learn from these renowned contributors: Sharkie Zartman, MS; Don Hurzeler; Helen Dennis; Betty A. Sproule, PhD and J. Michael Sproule, PhD; Jeanne Peters, RD; Thomas W. Storer, PhD; William Stetson, MD; Dominique M. Scott, DC; Victoria Dupuy; Robert A. Weil, DPM; Mylaine Riobe, MD; Brent Cortright, PhD; and Kathi Fry, MD. If you’re ready to get started, open any chapter you like, take notes on what resonates with you, and start on a journey to live your best life NOW. It’s your time to shine! Have Fun Getting Fit from Spoilers Press is also available on Amazon! Who says that getting fit has to be a chore? 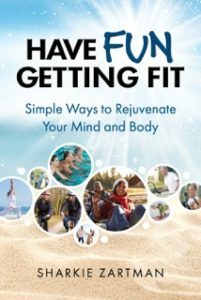 This book was written to inspire people to get off the couch, move, and step up to the challenges of aging. As a former athlete, I know t hat you don’t give in to the opposition. You take charge and do what you can to be successful. And as we age, fitness really is the fountain of youth and does allow us to live life to the fullest! If you need some motivation to get started on a program, this book will be a great resource! Enjoy the site and please feel free to contact me if you would like a free initial health consultation or need an inspirational speaker to get people off their butts:) I love inspiring others to take charge of their lives! Here’s a fun, short piece I wrote about how to step up to aging. Until recently, I always thought that the phrase, “Aging is NOT for Sissies,” was meaningless and degrading. Is it just me or does your body sometimes take on a mind of it’s own and not work like it used to? All of a sudden, why am I limping? Or why can’t move one of my fingers? Did I just acquire four more wrinkles overnight? Who came in my room last night when I was sleeping and beat me up? Where did these bruises come from? I don’t remember falling or getting hit. In the Aging Game, we have to be ready for anything and everything. When we get knocked down by one of age’s bombs, we have to brush it off, get back up and keep moving forward. If we feel sorry for ourselves or don’t take action, we’ll get run over, and become an aging statistic. You could even end up becoming a grumpy old person no one wants to be around! Who, if anyone would want to live like that? Now’s time to thicken our skin and get tough! These speed bumps are part of the road we travel as we age. It’s the price of being on this planet longer than our departed friends. Winning at the game of aging is tough and therefore not for wimps. So if life hits hard, imagine how much harder and how much more often it hits as we age? As we play the aging game we need to remember that winning is an ongoing process. We win some, and we lose some, but we never give up on life! Life is too precious and there is still so much more to enjoy, experience, and share. So toughen up and enjoy the bumpy ride! It’s time to get off the bench, put on your helmet and get into the game!